I authored an article on making melt and pour soap for HomeArts magazine. If you’re a subscriber, look for us on page 26 & 27. 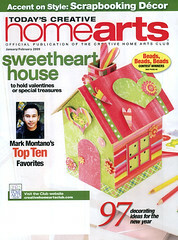 HomeArts is a monthly publication by the Creative HomeArts Craft Club. If you’d like more information about their members-only product testing club, click here to be taken to their site. I did a fall Bee & Honeycomb design (utilizing mica as a dusting powder to really make the design stand out) and a marbled Fall slab soap. It was an honor to be included as an expert for their magazine. Congrats A-M! I’ll see if I can get my hands on a copy. Robin, Thanks for noticing it was me. I wish that they had included my last name in the article rather than lumping me in with Cher and Madonna from the “So Famous We Just Need One Name” tribe but they did toss in Bramble Berry so that was lovely. Hot Dog! I have that mag! Congrats Anne-Marie! I’m going to find it now! Congrats Anne-marie. I think its wonderful how you’ve already started the new year off running. Congratulations Anne-Marie! How exciting for you and Brambleberry. Those are some smart editors to make sure they include you. I’m delighted to see you there and am so enjoying watching your business grow and expand. You look like you’re having tons of fun too! And that just makes it better.